FORT LEAVENWORTH, Kan. — It's been a long time coming for one Leavenworth family. Decades after his death, a World War II veteran is no longer missing. "It was an honor to be here," said Christopher Bender, Assistant Fire Chief of Operations, Fort Leavenworth Fire Department. 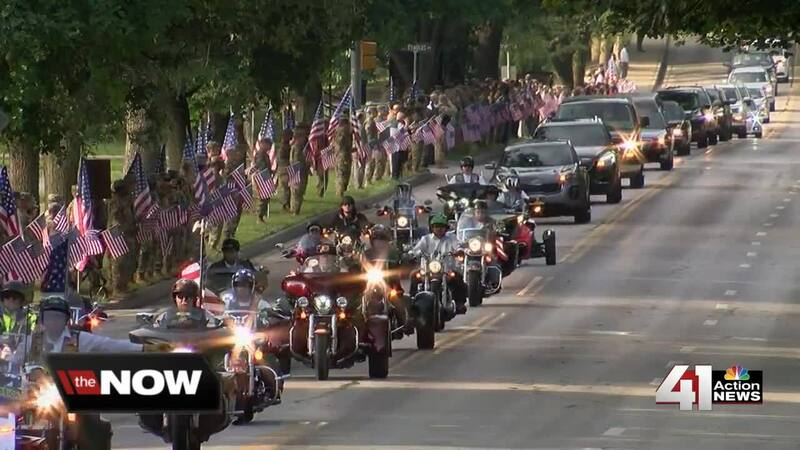 Friends, family and strangers lined the streets of Fort Leavenworth, Kansas Monday. "It's just important to take a moment and give back and show some respect for what we have here in this country," said David Grisdale, Leavenworth Resident. Some held American Flags, others saluted their fallen brother. "He was a brother, even though he's been lost a long time, he's still part of that family," said Ron Wurtele, Ride Captain, Patriot Guard Riders. After 75 years, Army Air Forces Staff Sgt. Vincent L. Politte made his way home. "I never dreamed it would ever happen," said Leo Politte, Brother. In the summer of 1943, Politte, 19, was serving as an aircraft gunner in World War II. He was on a mission over Romania when his aircraft was shot down. Following the war, his remains had gone unidentified until now. "When I learned about this, it was like I had to mourn all over again," said Dorthy Culp, Vincent's sister. Culp was 17 years old when her brother was killed. Now, more than seven decades later, she and her family were finally able to bring him home. "There's closure, and there's a sense of what he did for us, we should be more aware of that," said Politte. Politte was buried in the Fort Leavenworth National Cemetery with full military honors. Sixteen million Americans served in WWII, and more than 400,000 died. Currently, there are nearly 73,000 service member still unaccounted for from WWII, awaiting their homecoming. Politte's name is recorded on the Tablets of the Missing at the Florence American Cemetery in Italy, along with others declared Missing in Action (MIA) from WWII. A rosette will be placed next to his name to indicate he has been accounted for.